making enchilada’s without chillis in adobo! To be honest, if I saw the title of this dish I would keep scrolling – but please, trust me. They are very good. Somewhere along the line our Target (Princeton Target, I’m looking at you), stopped selling chilli’s in adobo. Unclear as to why they did this but I would just hop over to Wegman’s and get them there…except they don’t seem to have them anymore either. I think that they give enchiladas that smokey heat that authentic mexican dishes have so I was really debating to order some on Amazon until I got the idea to swap in sriracha. Disclaimer: I don’t even like sriracha so if you do I’m sure you’ll think these are amazing. 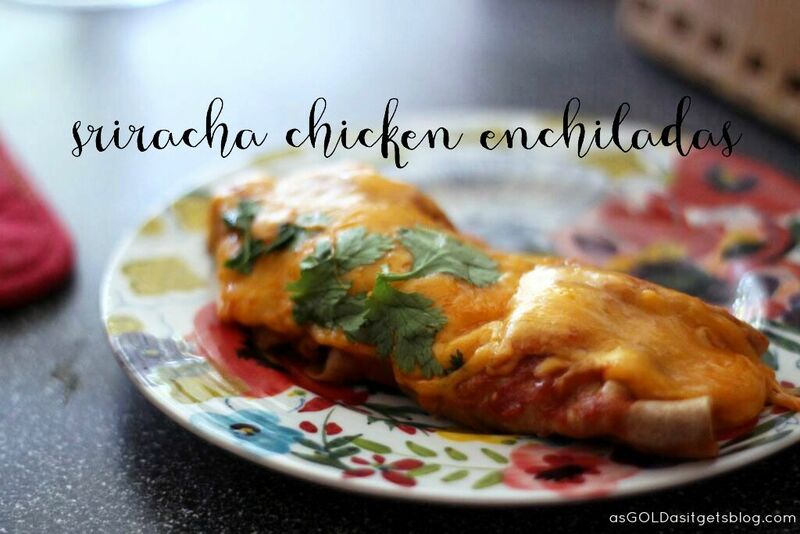 These enchilada’s were a early hit in our relationship and I think one of the first things I made for JPS and definitely the first thing I made for his family (at his suggestion!). I started with SkinnyTaste’s chicken enchiladas and adapted them when I couldn’t find chillis in adobo. The filing is easy. I cook chicken with garlic salt and pepper in a skillet, pop it in the kitchen-aide with the paddle and shred it up. If you don’t shred your chicken this way. Put the forks away! It will take you about 10 seconds to shred! 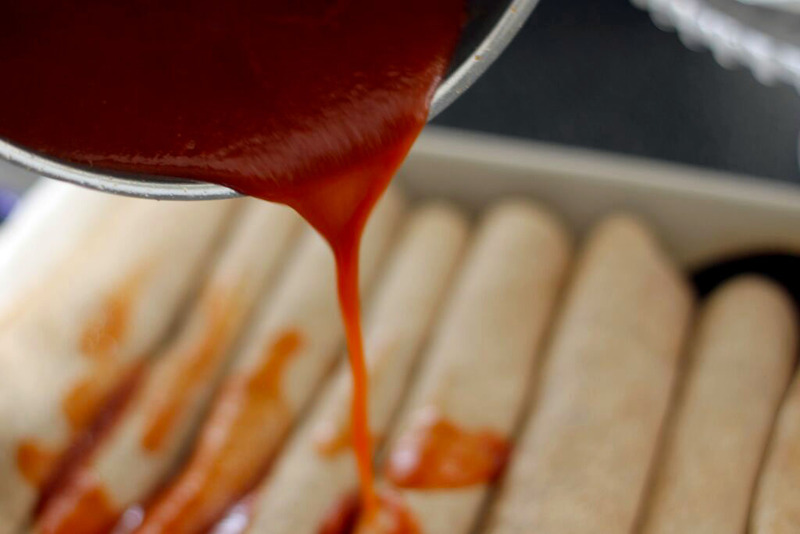 While you chicken is cooking in the skillet you can make the enchilada sauce. 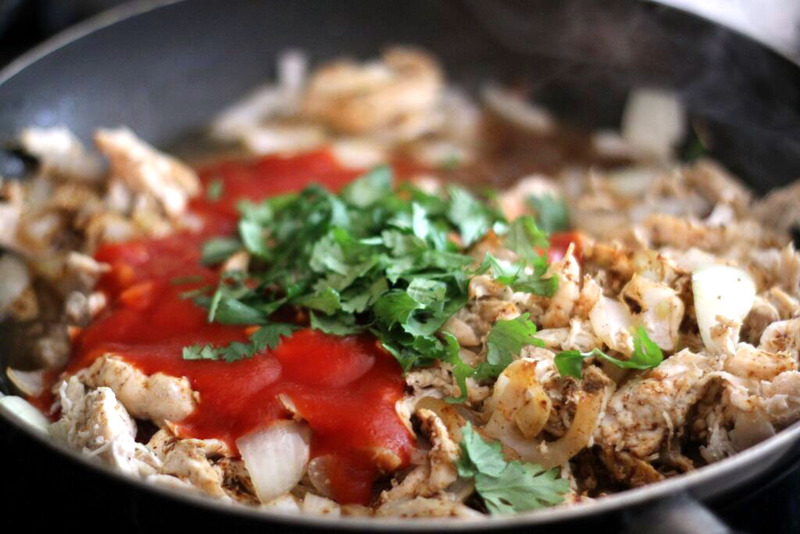 Saute your diced onion and garlic, throw in your tomato sauce, chicken and cilantro. Add your cumin, garlic powder and a little salt and pepper. The aroma will really make you salivate! 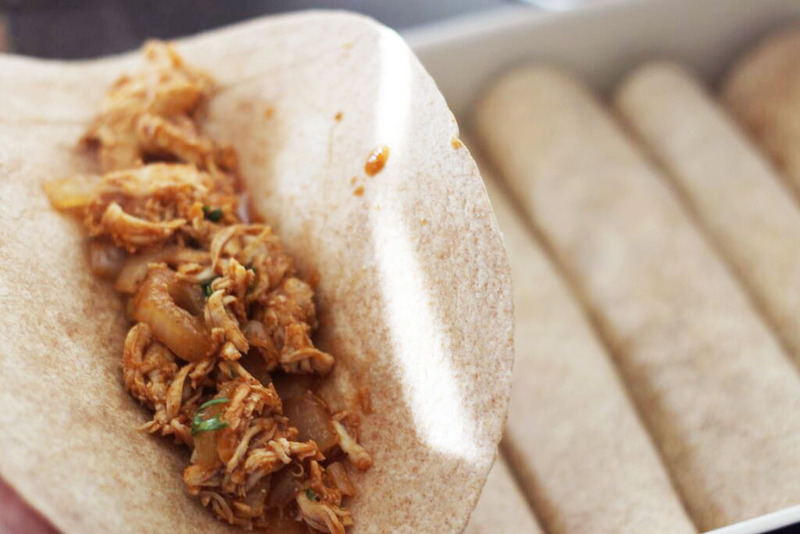 Once you have let that simmer and flavors blend you want to fill your tortillas and roll them so the seam is down and they are in a little line in your casserole dish. I like to put a little more cilantro on the top after they come out and feel free to add sour cream! They have the smokey heat from sriracha so salsa would probably be too much for this dish. 2) Cook chicken tenders with a olive oil in hot skillet. Sprinkle them with salt and pepper. Once fully cooked throw into kitchen aid mixer and using paddle attachment shred chicken on low. Set aside to cool. 3) In a medium saucepan, use a little olive oil or non-stick spray and salute garlic. Add sriracha, chili powder, cumin, chicken broth, tomato sauce and salt and pepper. Bring to a boil and once boiling, reduce heat to low and simmer for 5-10 minutes. Set aside until ready to pour over tortillas. 4) Saute your diced onion and garlic. 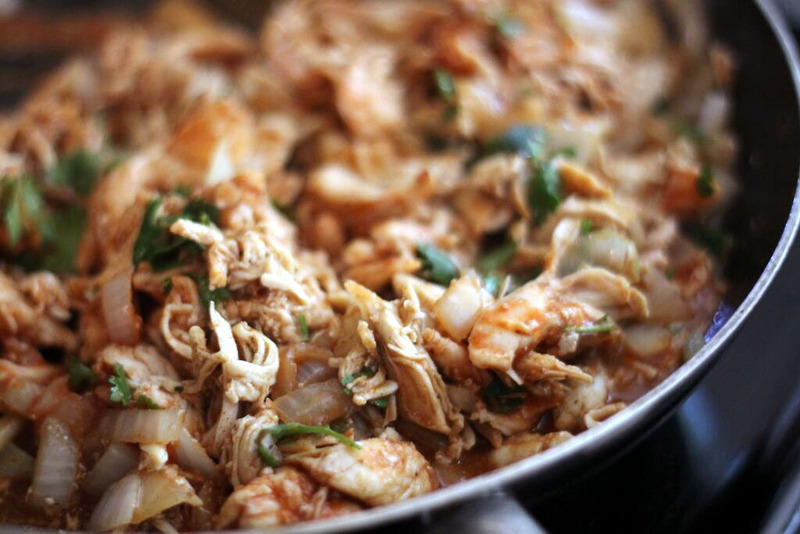 once translucent (1-2 minutes) throw in your tomato sauce, chicken, cumin, chili powder, tomato sauce, chicken broth and cilantro, add in a little salt and pepper. 5) Let everything simmer on the stove for around 15 minutes so the flavors can blend. Then you want to fill your tortillas and roll them so the seam is down and they are in a little line in your casserole dish. 6) Once all aligned (they can be very close, it doesn’t matter) pour sauce over the entire tortilla so the edges don’t get crispy. Top with a generous amount of cheese. 7) Cover with foil and cook for 20-25 minutes. Take off foil and broil for 2 minutes so cheese is bubbling. Now you need have to worry about hunting down chills in adobo – just use sriracha! 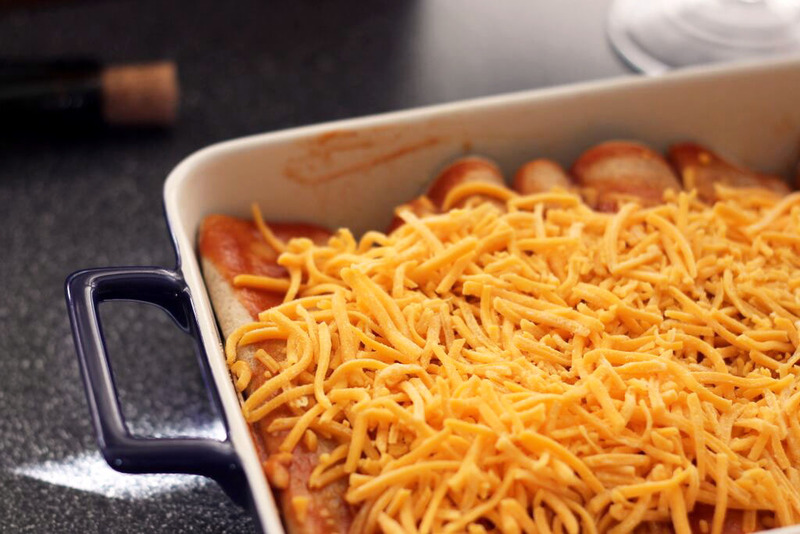 Categories: Good Eats | Tags: easy dinner, enchilada, healthy dinner, healthy recipe, mexican food | Permalink.